The provisional programme is now online. 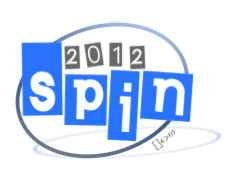 The 19th International SPIN Workshop on Model Checking of Software (SPIN 2012) will be held in Oxford from 23-24 July 2012. SPIN 2012 is the latest in a successful series of workshops for practitioners and researchers interested in state space-based techniques for the validation and analysis of software systems. As in previous years, the proceedings of SPIN 2012 will be published in Springer-Verlag's Lecture Notes in Computer Science series.